Monthly get-togethers generally fall on the 4th Sunday of each month with exceptions to avoid holiday weekends. Meeting Location: The Ciociaro Social Club, 144 Bridge Street, Newton, MA. Doors open at 1p.m. Meeting activities begin at 1:30p.m. and run until approximately 4p.m. All meetings are open to the public. Newcomers are cordially welcome. There is a small parking lot adjacent to the building and on-street parking is available. Deja Vu is a duo of Dave Magliozzi on accordion and Ann Harter on vocals who perform nostalgic songs from other times and places. Christmas Party is December 16th. Format is Pot Luck. Come one, come all, bring a favorite holiday treat. HOLIDAY MEETING! More details to follow! Gary Morin and Violinist perform! January 25th Theme: Party Music HOLIDAY MEETING! Bring a song for you to swap! March 22nd Yes Theme: A new song you have learned Jan and Lou Borelli perform with their 8 piece band. April 26th Yes Cory Pesaturo, World Champion Accordionist performs! 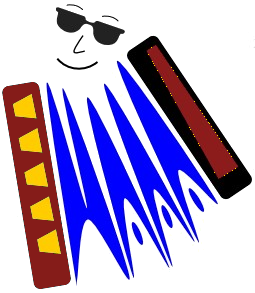 March 23rd No Play-along Yes, Theme is 50's - 60's Gary Morin's presentation on "Playing along with another Accordionist". May 4th (No April mtg.) Yes No Open Mic Jan & Lou Borelli on "Playing along with other instruments"
This meeting is Open Mic only so bring music!! June 23rd Henry Mancini Any style but consider Blues and Boogie Blues!! Open Mike WILL take place, bring your accordion! Member Coach Dave will be presenting a workshop expanding on what Patty presented on Blues in May to include early Rock and Country and its expansion into modern music. All players will be invited to participate. Open Mic, your choice A special performance by , a truly accomplished accordionist from Sweden. You won't want to miss this! Italo DeMasi presentation on "The Power of Midi"
MEETING HAS BEEN CANCELLED BECAUSE OF SNOW! Breakout sessions with Dave R., Dave M., and James G.
"Left Hand Changes to Enhance Your Performance Immensely"